He did not break out into a huge smile and there was no whoop of joy after he cleared the bar and landed on the pit. 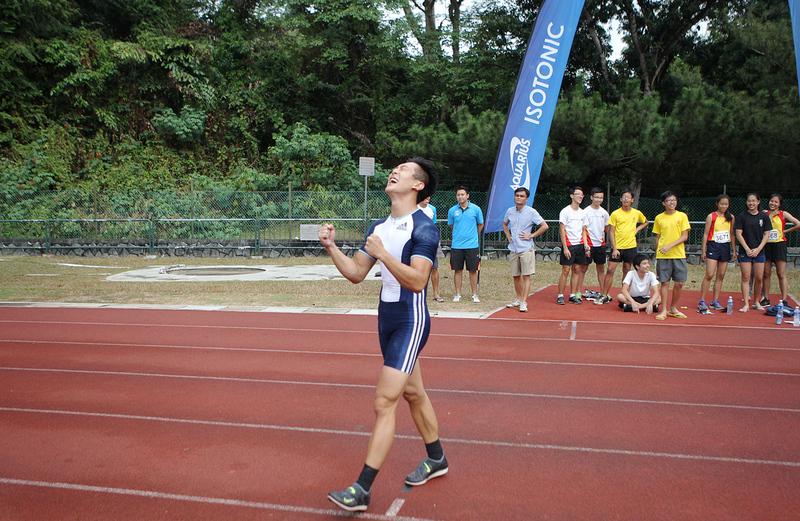 Instead, pole vaulter Sean Lim simply wore an expression of disbelief. He knelt for a moment, before pointing to the sky as if thanking the heavens. He then sprung up and ran towards his coach David Yeo, jubilantly screaming so loud it drew the attention of the 800m runners on the other side of the Bukit Gombak Stadium. 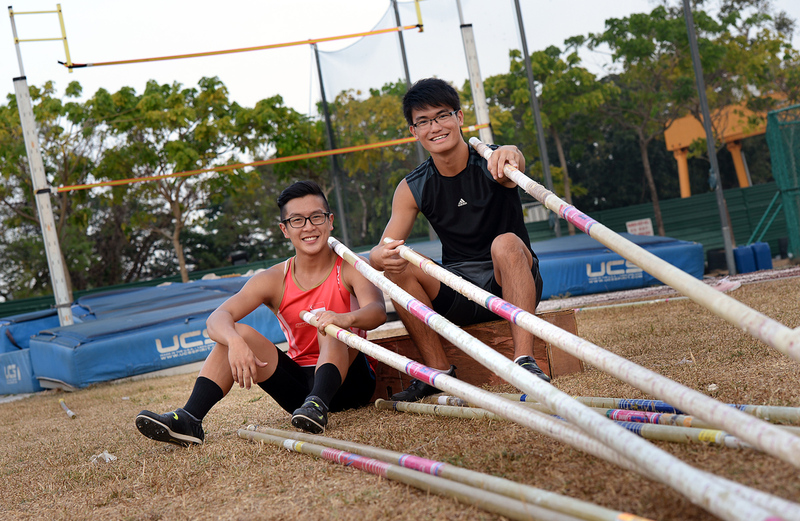 No Singaporean had gone over the five-metre height in the pole vault until ySunday at the Track and Field Series 2014, when the 20-year-old set a new national record at 5.01m. The previous record of 4.91m was set by teammate Chan Sheng Yao at the Singapore Youth and Junior Championships earlier this month. Lim believes he can repeat his celebratory antics in front of his home fans next June, when Singapore hosts the 2015 South-east Asia (SEA) Games. "My coach has put a lot of hope in me for the SEA Games," he said. "It's going to be on home ground; I have to go for that gold medal." 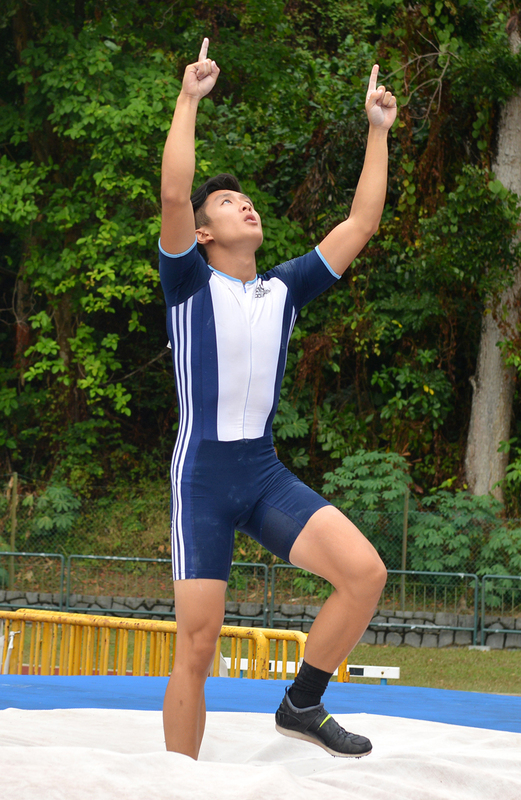 To achieve that prize, he aims to beat the SEA Games record of 5.21m, set by Thailand's Kreeta Sintawacheewa in 2009. Sintawacheewa also won the gold medal at last year's Games in Myanmar, clearing 5.15m. Lim and Chan have traded national records over the last few months and were expected to engage in an intense duel yesterday. They started the competition only at 5.01m, with Chan failing all three attempts and Lim succeeding only at his final try, albeit with a little room to spare. Chan, though, aims to get in on the record-setting act again. 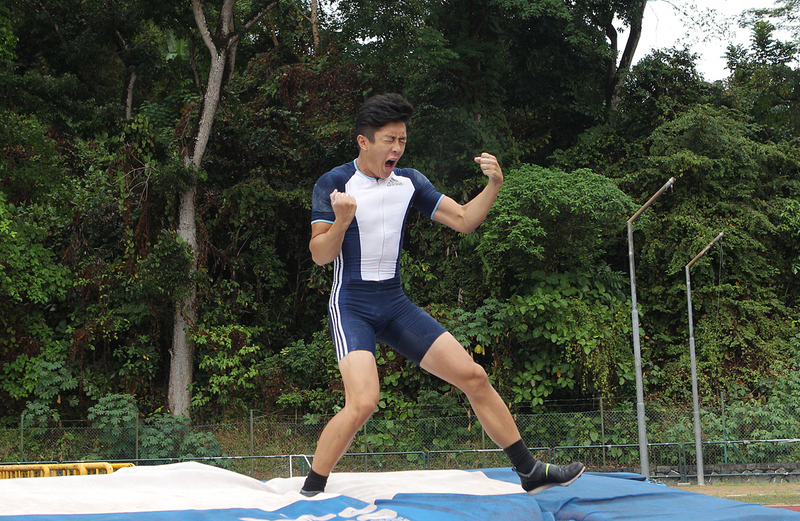 The 18-year-old Hwa Chong student said: "I came in with the target of 5.05m, which would have seen me qualify for the World Youth Championships (in July). "I had the speed today but, after take-offs, everything went haywire. "I'm not worried though, I have the national schools championships next month and I'm confident I can hit 5.05m then." Lim's switch to a longer pole worked a treat on Sunday. He used a 16-foot pole for the first time, ditching his old 15-footer, which had "reached its peak". "The new pole gave me a better push. Like a tighter rubber band, I could store more energy before the jump," he said, still beaming about half an hour after his record-breaking feat. He has now broken the national record four times since eclipsing Mok Hay Foo's 18-year-old mark of 4.66m when he cleared 4.80m in 2011. "Clearing the five-metre mark was really a moment today. It had been such an elusive height for me the past three years," he added. "I've cleared it in training before, but could never bring it to competitions. "Now that I've passed this mental barrier, I feel reaching higher could be easier for me." 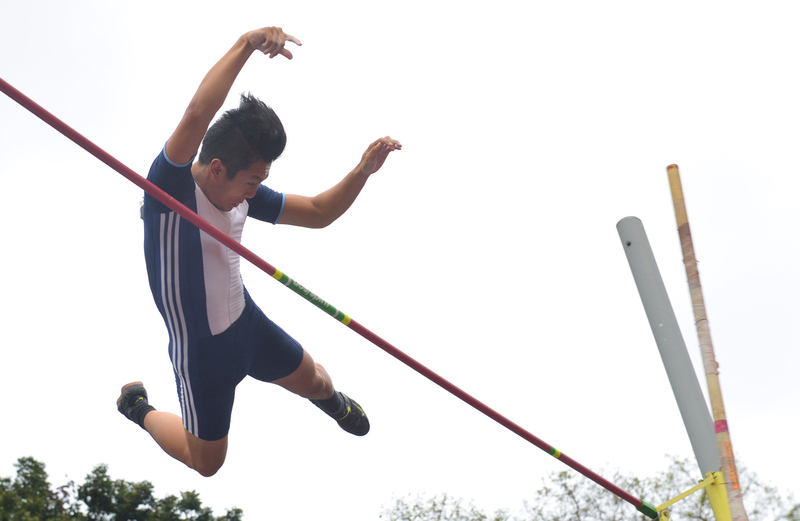 National pole vaulter Sean Lim set a new national record of 5.01 metres at the Singapore Athletics Assocation's (SAA) Track and Field Series 3 at Bukit Gombak Stadium on 16 March 2014. 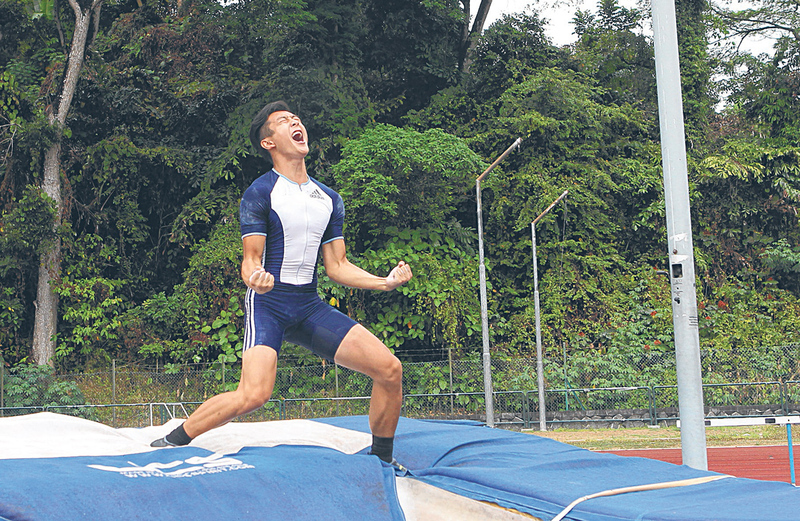 Pole vaulter Sean Lim euphoric after setting a new national record of 5.01m at the Track and Field Series 2014 on Sunday. 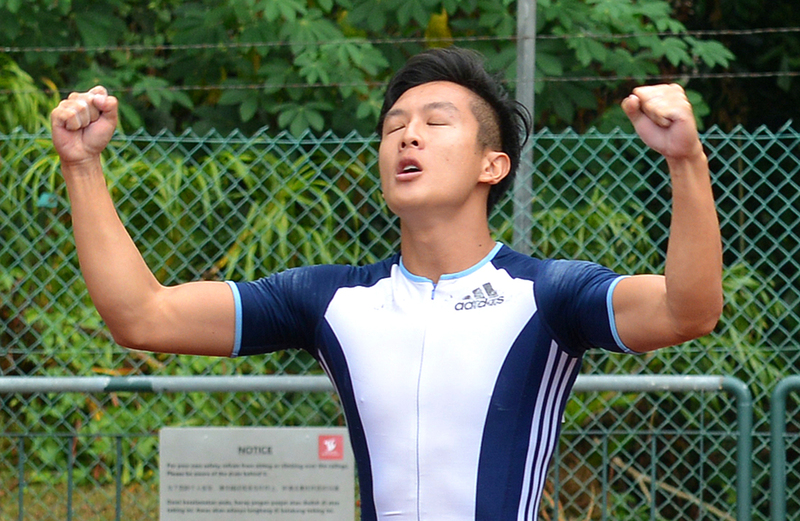 Pole vaulter Sean Lim euphoric after setting a new national record of 5.01m at the Track and Field Series 2014.
ole vaulter Sean Lim euphoric after setting a new national record of 5.01m at the Track and Field Series 2014. 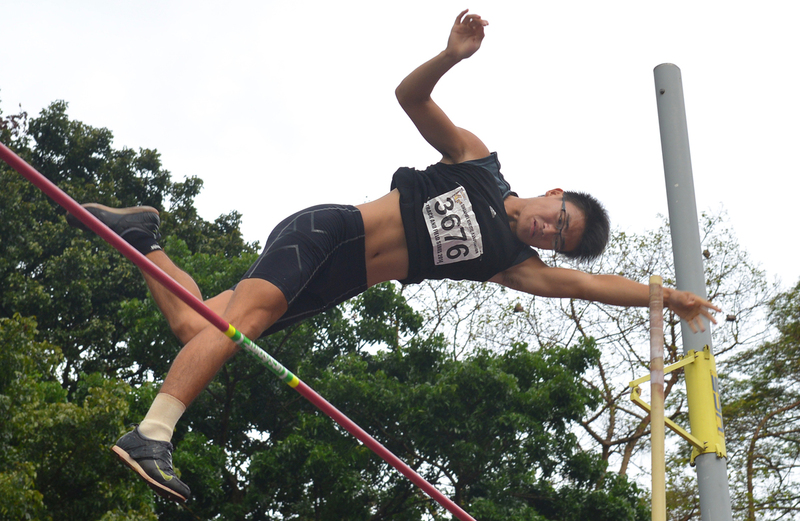 Pole vaulter Chan Sheng Yao failing to clear the 5m height at the Track and Field Series 2014 on Sunday. 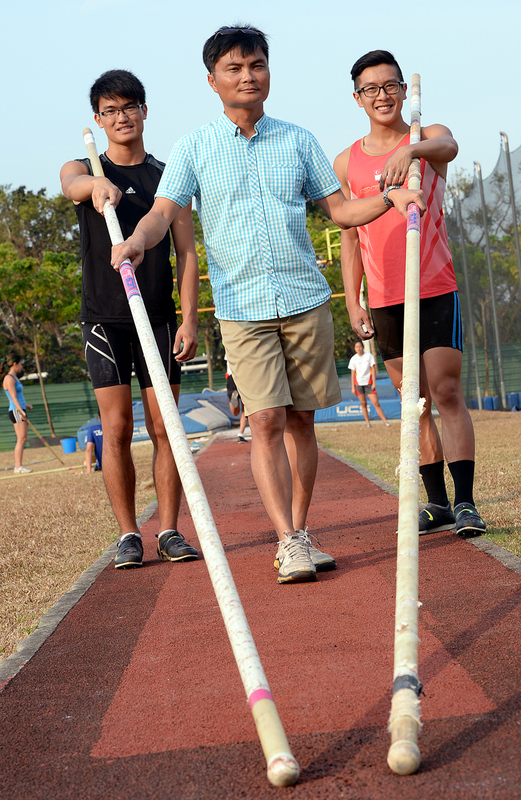 National pole vaulters Chan Sheng Yao (left), 18, and Sean Lim (right), 20 with their coach David Yeo.